Welcome to Meadow View - Holidays in the Country. 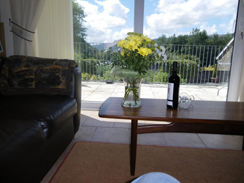 Located in the beautiful Neath valley, Meadow View is a well equipped contemporary bungalow providing self catering boutique style accommodation to an excellent standard throughout, with a 4 star accreditation from Wales’ official, nationwide quality assessment scheme (Visit Wales ). Situated adjacent to the Brecon Beacons and a short drive from the coastal beaches of the Gower, an area of outstanding natural beauty. The cottage is a good base for walking, fishing, cycling and outdoor adventure sports, suitable for all ages. Spectators of sport also can find a warm welcome with easy access for Heineken Cup Rugby with the Ospreys and Championship Football with Swansea City. 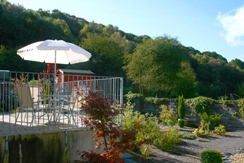 It has a balustrade balcony overlooking a landscaped garden and the valley. Watch the wild life and hear the bird song all year and in winter see it through the large patio doors in the comfortable lounge, cosy on the two leather sofas. The bungalow has off road parking. So if you have plans for an outdoor adventure, to attend a sporting event or just want to relax with a beautiful view then why not try the warm welcome that Val and Don provide at Meadow View.